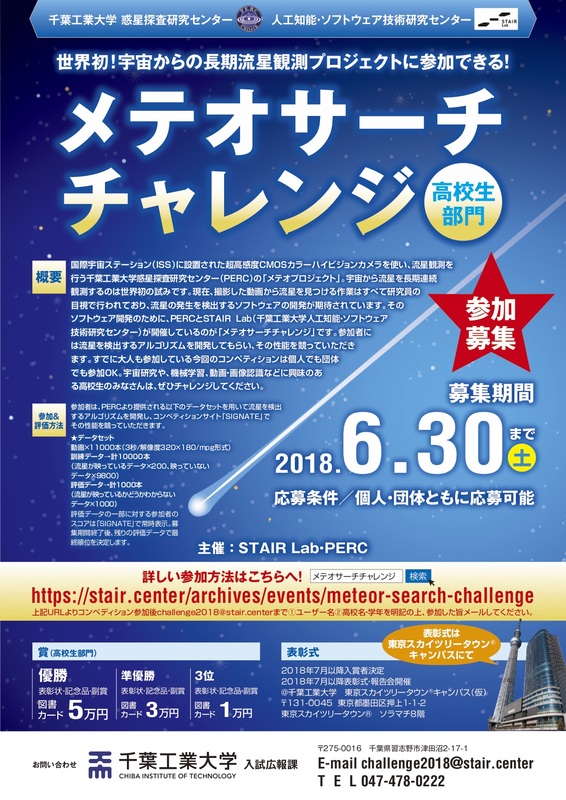 Since 2012, Chiba Institute of Technology Planetary Exploration Research Center (hereinafter PERC) has been working on the project called "Project Meteor", where long-term continuous meteor observations using ultra-high-sensitivity CMOS color high-vision cameras from International Space Station (ISS) are made. Actually, it's quite difficult to manually detect the meteor occurrence in the captured video as the duration of meteor illumination is usually less than 1 sec and it's impossible to predict when and where it occurs. Therefore, STAIR Lab presents you a challenge to develop an algorithm which automatically detects the meteor in the video. The competition is organized by Software Technology and Artificial Intelligence Research Laboratory (hereinafter STAIR Lab) and uses data from PERC. An algorithm should take 3 sec motion video as input and classify it into two groups based on the meteor occurrence. Train set contains 10000 videos whilst test set does 1000 and the number of videos with the meteor occurrence in the train set is 200. The video format is mpg and its resolution is 320 x 180. We've additionally set up a department for high school student. The task and rules are the same as what are applied to general participants. Please see the FAQ page for details. 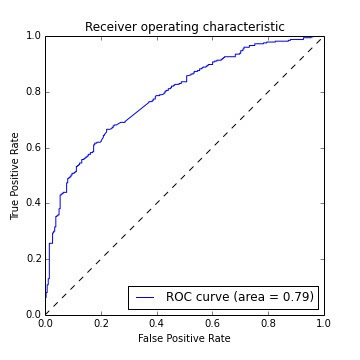 Submissions are scored on the AUC (Area Under the Curve). 1. During the competition, scores on the leaderboard are computed based solely on a fraction of the test set. We use the rest of the set to evaluate and determine the final ranking after the competition. 2. If you have the same score with the other participants, the rank will be placed on a first-submit. 4. When a person is disqualified, its runner-up will be eligible for winning the prize. Please keep in mind to create a practical model as each competition, in principle, has its own goal such as achieving business challenges, solving social problems, and sharing results of studies. ・You may have one account per participant. Please follow these procedure to create a team. 1. Create a SIGNATE account for each member. 2. Send us a mailing list of the team by a team leader's email address. Please use a team leader's account to submit predictions. ・Sharing code or data outside of teams is not permitted. ・You may use external data as long as it can be obtained for free and does not infringe any third party rights. ・Annotating on the train set is permitted. ・Manually annotating on the test set is not permitted. ・You may use any softwares as long as they are open sourced and free. ・Modeling process should be divided into 3 parts and a source code for each part has to be executable independently. Define functions for both train and test set. Define functions that generate such as pre-trained model, feature importances, and results of cross validation. Define functions that generate predictions by importing input variables and pre-trained models. 1. Sign up for SIGNATE and enter the competition.